Imagine producing artisan breads in your own oven, such as Focaccia, Pizza, Ciabatta, Pain au Levain and French Baguettes. Experience Italy without the airfare as we teach you classic Italian dishes from Antipasto to Zabaglione. Learn classic sauces from a simple but sublime Aglio e Olio to a classic Ragu Bolognese. We’ll share our secrets for perfecting Tiramisu and teach you how to make the best Cannoli this side of Palermo. Have a special request? Put your own group together and we will collaborate on a theme and a date. A check or cash for the full amount of the class is needed to complete your registration and reserve your spot in the class. Space is limited. A 7-day cancellation notice is required for a full refund. If classes are cancelled due to insufficient enrollment, you will have the choice of receiving credit for another class or a full refund. Be sure to check our EVENTS page for cooking class dates and times. If you don’t see one scheduled at a time that works for you feel free to contact us with a suggested date and theme and we will do our best to accommodate you. This introductory class is geared to the novice baker with little or no experience in bread baking. Prepare to amaze and delight your family and friends with the skills that you will learn in this class. 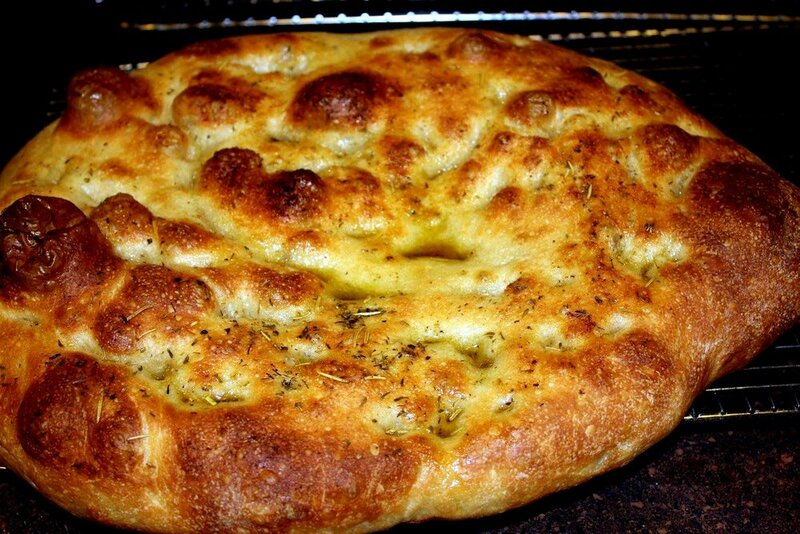 Flatbreads are among the easiest breads to learn as well as being among the most delicious. In this class you will learn how to make classic Rosemary Focaccia, Sicilian Sheet-pan Pizza, Greek Pita and a Syrian flatbread called Markouk. Allow at least 4 hours for this class that includes a pizza luncheon. You will go home with recipes, breads to share with your family, dough to make your own at home and of course a great sense of accomplishment. $90 per person. Class size is a minimum of 4 and maximum of 6. Ask about group discounts when you form your own group. With this fun theme we select signature dishes from the cookbooks of world famous chefs. From David Chang’s Momofuku there is his famous Bo Ssam, Scallion Noodles, or Pok Pok’s to-die-for Vietnamese Chicken Wings. From Thomas Keller’s Ad Hoc At Home enjoy the best fried chicken north of the Mason Dixon Line. We have an extensive library of cookbooks so there’s no shortage of ideas. Feel free to make a suggestion and we will consider it. Choose your own culinary adventure! This two night special includes a simple but satisfying bistro style dinner the first night. Awaken the next morning to a gourmet country breakfast followed by some free time to wander about the farm. Rejoin us in the kitchen to begin your customized cooking class. Retire to your room and let the sounds of Crippen Creek lull you to sleep. Before departing the next day you will of course be treated to another fantastic breakfast. $510 per couple (plus tax).